Pantomime (noun) – a theatrical entertainment, mainly for children, that involves music, topical jokes, and slapstick comedy and is based on a fairy tale or nursery story, usually produced around Christmas. “Someone lift the camel’s head! It looks like she had a stroke,” yells Sarah Quick at two performers in a floppy-headed camel costume on the Lakeview Arts Barn stage. The theatre audience, comprised mostly of children, bursts out in high-spirited laughter. When: Friday, December 7 and Saturday, December 8, 2018 at 8 p.m.; Friday, December 14 and Saturday, December 15, 2018 at 8 p.m.; Saturday, December 8 and Sunday, December 9, 2018 at 2 p.m.; Saturday, December 15 and Sunday, December 16, 2018 at 2 p.m. Written by Sarah Quick. Directed by Sarah Quick and James Barrett. Starring Armon Ghaeinizadeh as Ali Baba, Sarah Quick as Kai Ote, James Barrett as Dame Fatima Fandango, Siobhan O’Malley as Princess Fortunia, and a rotating cast of six adults and 50 children. A three-course table d’hôte menu is available at 6 p.m. prior to every evening performance. For tickets, visit the box office at Lakeview Arts Barn or call 1-800-304-7897 or 705-738-2037. This is the high type of energetic fun brought to Globus Theatre’s annual Christmas pantomime. 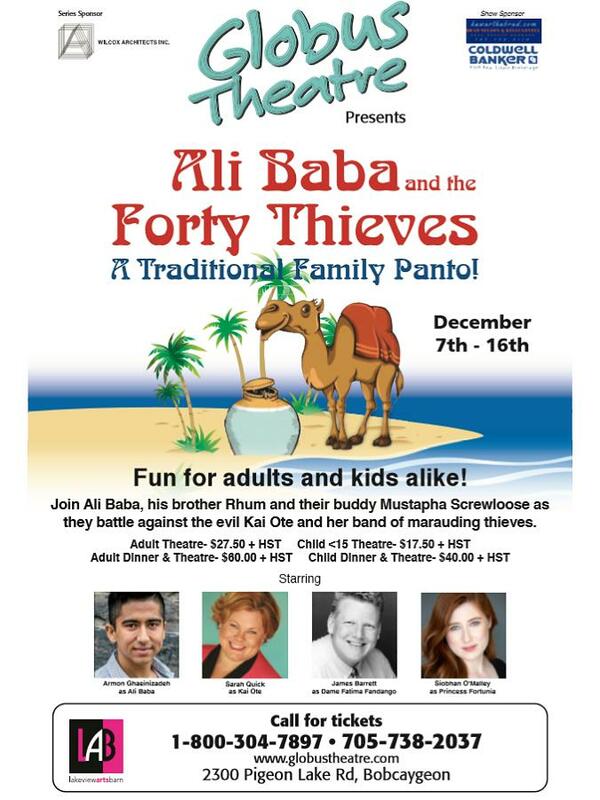 A holiday tradition for the last 13 years, this year Globus Theatre, under the direction of Sarah Quick and James Barrett, is presenting Sarah’s original production of Ali Baba and the Forty Thieves. Opening on Friday, December 7th, the pantomime stars Toronto-based performers Armon Ghaeinizadeh as Ali Baba and Siobhan O’Malley as Princess Fortunia, with Sarah as the villainous Kai Ote and James as Dame Fatina, alongside a rotating cast of 50 children and six adult performers. Sarah has been working with a huge group of children for six weeks; organizing the performers, who are separated into two different casts so that the most number of children can have the opportunity to experience acting, has been a massive undertaking. I am impressed how Sarah — despite dealing with a wide age range of actors, from elementary school age kids all the way to performers in their early teens — manages to keep everyone focused and engaged through the fast-paced rehearsal. 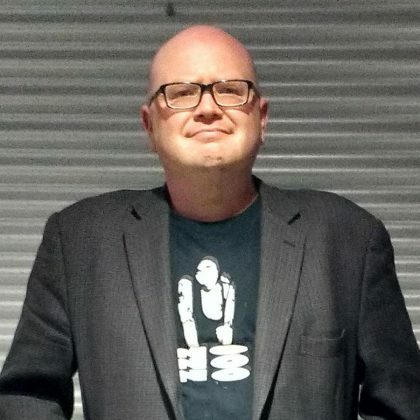 James and Sarah have welcomed families, as well as school audiences, back year after year in an annual performance that has become a tradition for many families in the Kawarthas. With Ali Baba and the Forty Thieves being the third pantomime I’ve seen at Globus, it has also become an unlikely yearly tradition for me. I thought I didn’t like pantomimes, until Sarah and James challenged me to attend their 2016 pantomime based on Little Red Riding Hood — which I found, much to my surprise, delightful. I allowed myself to fall under the magic of the performance, and became as involved as the kids. First performed in 2009, Ali Baba and the Forty Thieves is a revival of Sarah’s original take on the classic Middle Eastern folk tale from the Arabian Nights. What seems like an unusual choice for a Christmas pantomime is in fact, according to Sarah, a traditional one in England, from where she originates. The camel that Sarah speaks of is one of the highlights of the show, and even the performers are excited to see the two-piece camel prop come out. Complete with a fez placed on her head, Alice the Camel was created in 2009 by Victoria Schilling who went on to design costumes for Stratford. 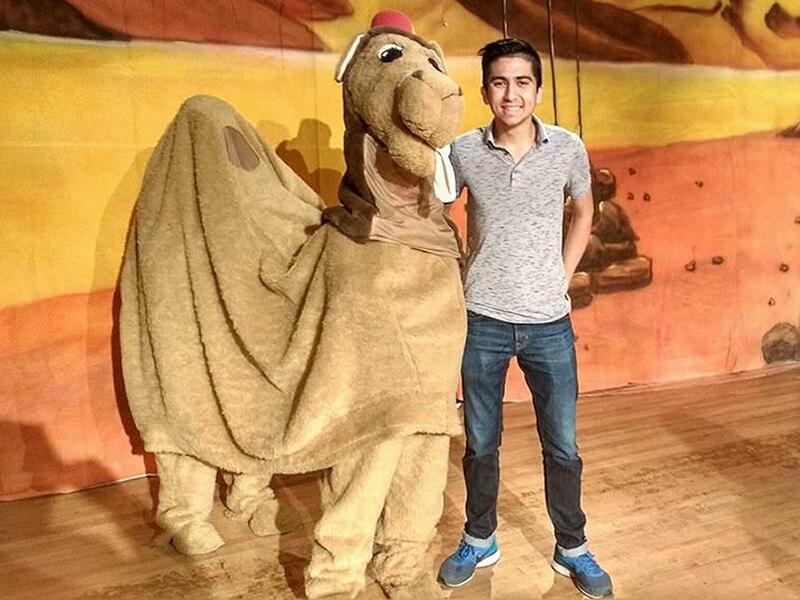 Taking time out during a brief break from rehearsal, I quickly get some photos with the camel and get to have a visit with this year’s lead, Armon Ghaeinizadeh. A recent graduate of the University of Toronto’s theatre program, Armon made his Stratford debut at age 11 in South Pacific, and has gone one to act, direct, and choreograph productions throughout Toronto including a one-man show, Lemon Lemon, in August 2018. After finding out about Ali Baba and the Forty Thieves from his friend Katherine Cappellacci, who played the title character in Globus’ Snow White pantomime last year, Armon is performing for the first time in the Kawarthas. For Armon, it’s also a new experience working with such a large cast of children. “I’ve worked with kids before and I’ve worked as a child performer, so I know what it’s like from both sides. But I’ve never worked with this many kids before. Fifty children is a lot. It’s a completely new experience but I’m ready. “I think it’s important to create a love for theatre in the next generation of performers. Things like opera and theatre and ballet are starting to lose the cool factor with the younger generation and, in my experience, it’s not as accessible and not targeted to younger audiences. James Barrett reprises his annual role as this year’s dame, one of the most important figures in the traditional British pantomime. This year, James plays Dame Fatima Fandango, the highly vivacious mother of Ali Baba. In British pantomime, the dame is a female character — often an older matronly woman — portrayed by a male actor in drag. As Globus Theatre’s resident dame, James has taken the traditional role for 13 years, requiring him to create different characters while still maintaining his unique style. James has found his own personal voice when performing as the dame, a character that remains popular with both children and adults. But as James points out, in our ever-evolving society the dame plays a more important part in the family pantomime now than ever before. James explains that the dame appeals to both adults and children for different reasons. One of the things that I think is so winning about the Globus pantomime is that, while it’s an over-the-top show for the kids, it’s also filled with subtle adult humour providing something for parents to enjoy too. Instead of being cute and patronizing, Sarah has a quality to her writing where the comedy comes from cleverness instead of slapstick. Filled with genuine laughs, charming performances, and a little bit of magic, Globus Theatre’s Ali Baba and the Forty Thieves is a holiday family show worth seeing. I was enchanted with the cast at the rehearsal I attended, and I can’t wait to go back to Globus for an actual performance. Christmas at The Lakeview Arts Barn is a beautiful experience, and a perfect destination for your own holiday celebration. It’s no wonder that entire families return year after year to the Globus pantomime. Although a new tradition for me, it’s one that I plan to continue for years and years to come. 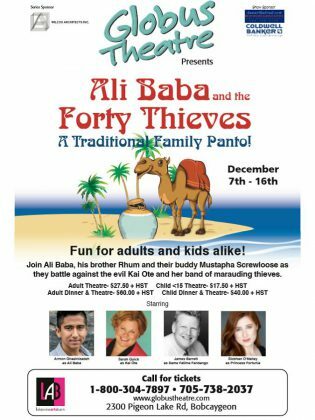 Ali Baba and the Forty Thieves has eight evening and matinee public performances: December 7th and 8th and 14th and 15th at 8 p.m., and December 8th and 9th and 15th and 16th at 2 p.m. A three-course table d’hôte menu is available at 6 p.m. prior to every evening performance. Theatre-only tickets are $27.50 plus HST for adults and $17.50 plus HST for children (15 and under). Theatre and dinner tickets are $60 plus HST for adults and $40 plus HST for children. For tickets and dinner reservations, call 1-800-304-7897 or 705-738-2037.